Sometimes, I really do miss China-Chinese food. Especially the dumplings (Jiaozi). The steaming, glistening, juicy, bursting at the brim yummylicious dumplings which are ordered in catties (minimum 2 catties and each cattie serves about 10-12 each- I THINK) and in oh so many flavours. Dipped in vinegar and topped with thinly sliced ginger. Its pure joy to bite into each and every one of them. Think xiaolongbaos at a budget and in abundance (8-10 to share vs. AT LEAST 10-12 per person – for me that is). This is comfort food at its best. I know there are many festivities where jiaozi are usually eaten in China for symbolical reasons. But, seriously, when in China, there is no need to long and wait for a festival to sink our teeth into such joy. There are restaurants dedicated to serve this wonderful food all year round and I used to eat (alot) of them in winter. Back in Singapore, we get the localised versions of dumplings. Which means its predictable in taste, so gone are my triple flavoured or egg and pork or spinach jiaozi. Oh well. So, is today’s post about jiaozi? Today’s recipe is about-NOODLES. ah well. Why the ramblings about jiaozi then? Err. Not too strangely, the first food I thought of when I mentioned China-Chinese food is neither rice nor noodles, but jiaozis. Like I said, I miss China-Chinese food, so, erm, it fits because they are all in the same family? 1 small bunch of coriander, leaves and stalks separated. In a large heavy pot (dutch oven preferably), heat some oil and sear pork ribs until it slightly brown and caramelised, in batches if necessary. Remove from pot and set aside. Add diced onions and sauté for 2 mins. Add carrots, celery, garlic, cinnamon, star anise and cloves. Fry for about 3-5 mins. Add the rice wine and allow to boil until the alcohol have evaporated. Arrange the pork ribs in the pot. MIx the tomato paste in 1-2 cups of water and add into the pot. Add more water to just cover the ribs (fine if parts of the ribs are sticking out of the braising liquid). Pour soy sauce over and bring to a boil. Reduce the heat to very low, cover the lid and braise for an hour. After an hour, open the lid to check the liquid level. If there is enough braising liquid, ladle about a cup out and mix with the coffee powder. If there is not enough braising liquid, simply use water. Pour it back into the pot. Finely chop the coriander stalks and add to the pot. Gently stir the ribs around. Cover and let it braise/brew for 10 mins. Taste the braising liquid and adjust accordingly (eg add more coffee, remove of cinnamon/star anise, add salt and pepper). Let it braise at low heat for another hour (or at least half an hour). 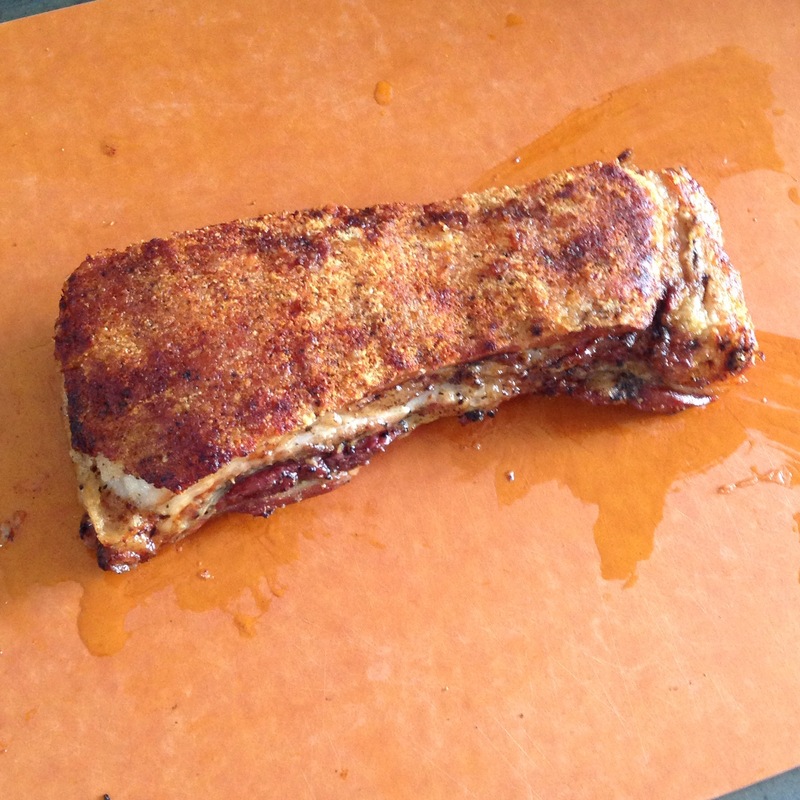 By this time, the ribs will be very tender and almost falling off the bone. Make noodles in a large pot of boiling water and drain. Gently remove the ribs from the pot and set aside. Turn off the heat and add chocolate (if using) to the braising liquid and stir to melt. Do a final tasting and adjust accordingly. Add the noodles into the pot of braising liquid and toss to coat. 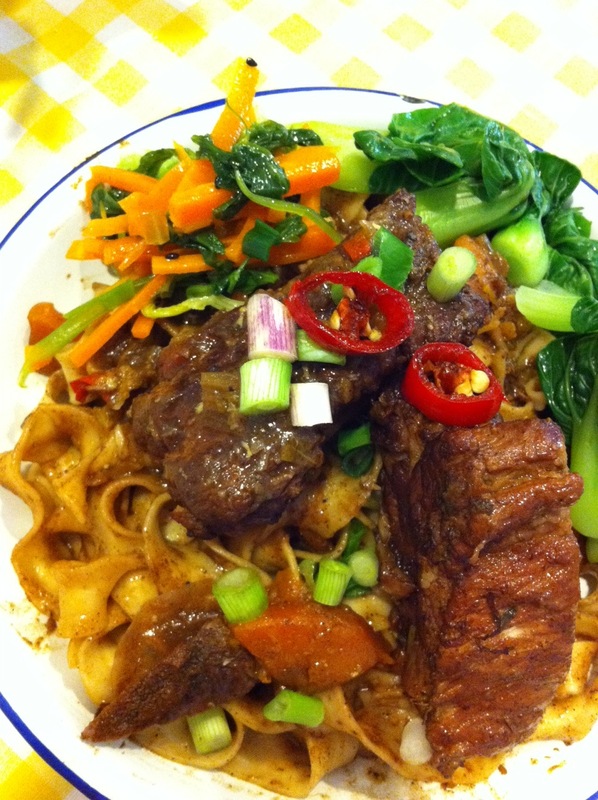 Serve noodles with pork ribs on top, some poached greens (eg pak choy), finally garnish with coriander leaves, spring onions and sliced chilli. This entry was posted in Cook and tagged braised, China, chinese, coffee, noodles, pork on March 13, 2013 by three3seconds. Pork recipes somehow appeals to zzz alot and he had cooked pork (western style) many times. Somehow his previous times never really resulted satisfactory, mostly overcooked due to mis-handling of the cooking time (pork loins are THICK!!). 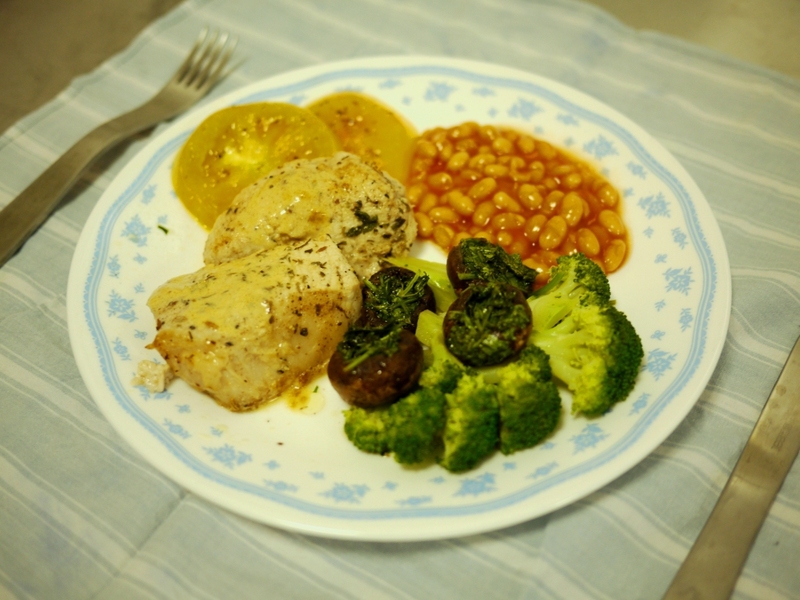 Well, thanks to Julia Child, he finally did a tender pork chops that even my mum said was good! 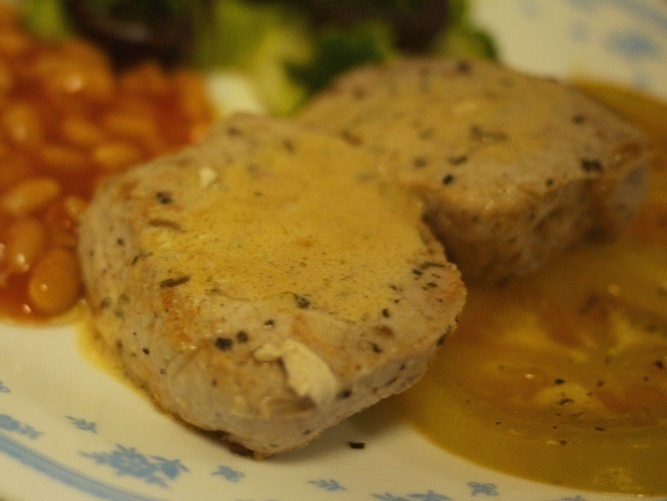 – 800 g pork loin cut into six 1.25 inch thick chops, beaten with back of knife or meat mallet, marinated in juice of 1 lemon, 4 tablespoons of extra virgin olive oil, thyme, cumin, salt and pepper for several hours. Preheat oven 160 deg celcius. Heat pork fat/lard a dutch oven until very hot. Brown the chops in hot fat, 2-3 at a time, 1 minute on each side. Remove and set aside. Pour out the fat, add 2 tablespoons of butter and garlic. Return chops back into the casserole, coating with butter and overlapping slightly if neccessary. Cover and transfer into oven and bake for 16 mins. Check to see if chops are done, if not bake for another 2-4 mins. Remove chops and set aside on warm plate and covered with foil. To make mustard-cream sauce, strain the meat juices, return to pot, add cream and mustard. Boil and simmer until thick. Season with salt and pepper. Remove from heat and stir in butter. Plate and serve immediately! This entry was posted in Cook and tagged julia child, pork, pork chops on November 22, 2011 by three3seconds. 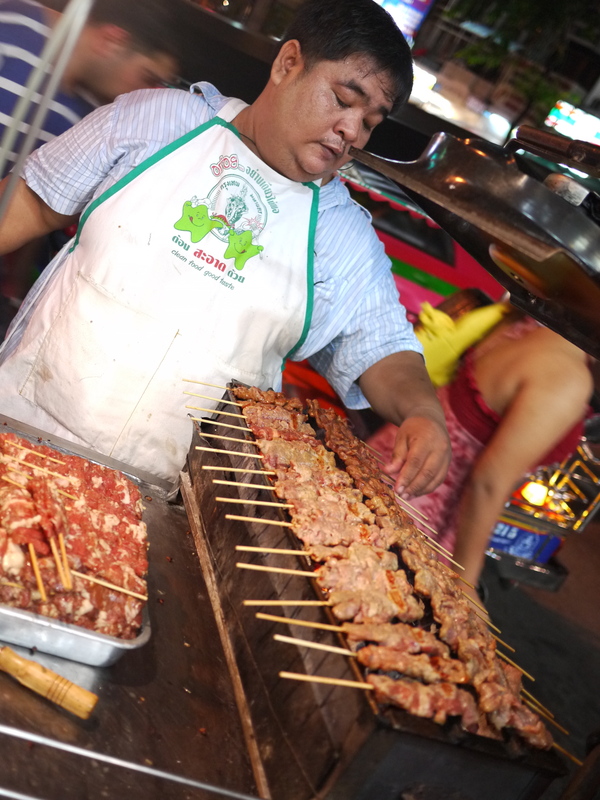 I’ve written about this amazing moo-ping uncle from Bangkok, remember this face because he is one Bangkok street food gem. 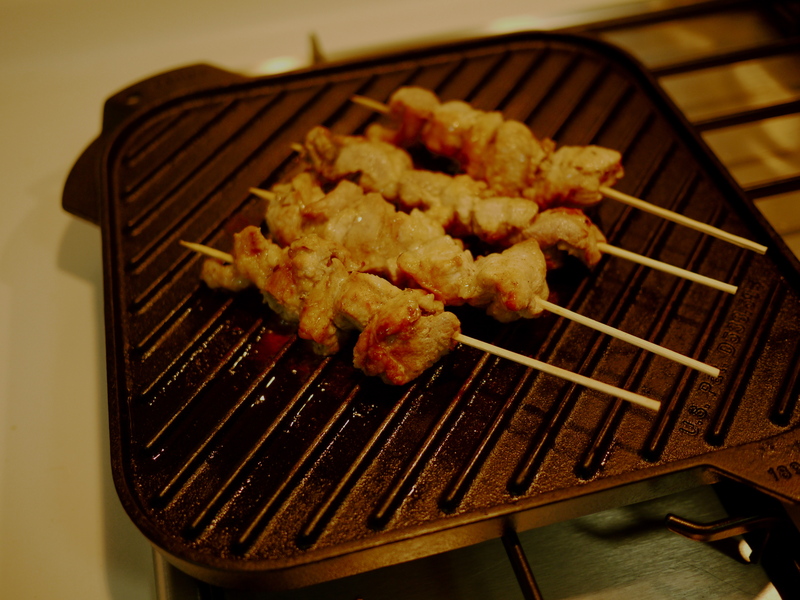 Moo-ping is Thai skewered grilled pork. 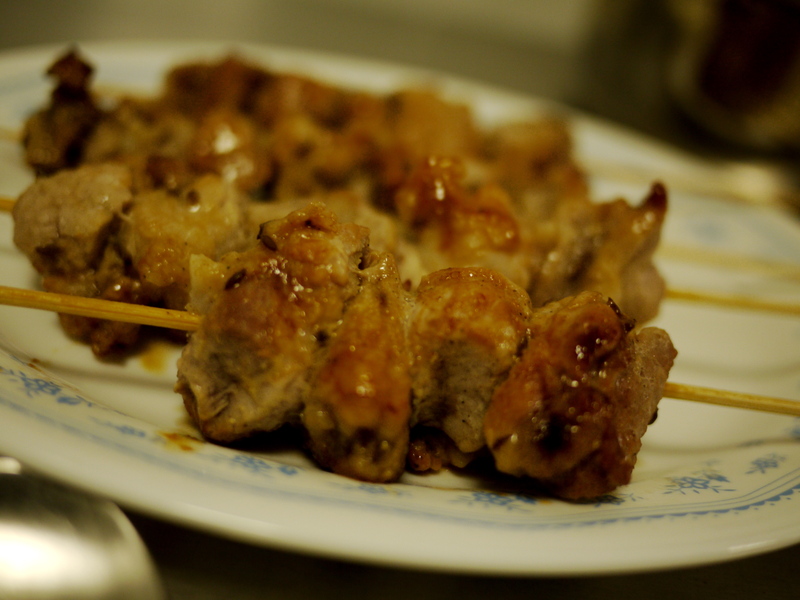 Grilled fatty pork and drenched in a burning concoction of home-made chili sauce. Add on a packet or 2 of glutinous rice to fill in the hunger. YUMs. no calories wasted here. And all for 10baht/skewer, well, thats’sS$0.45. 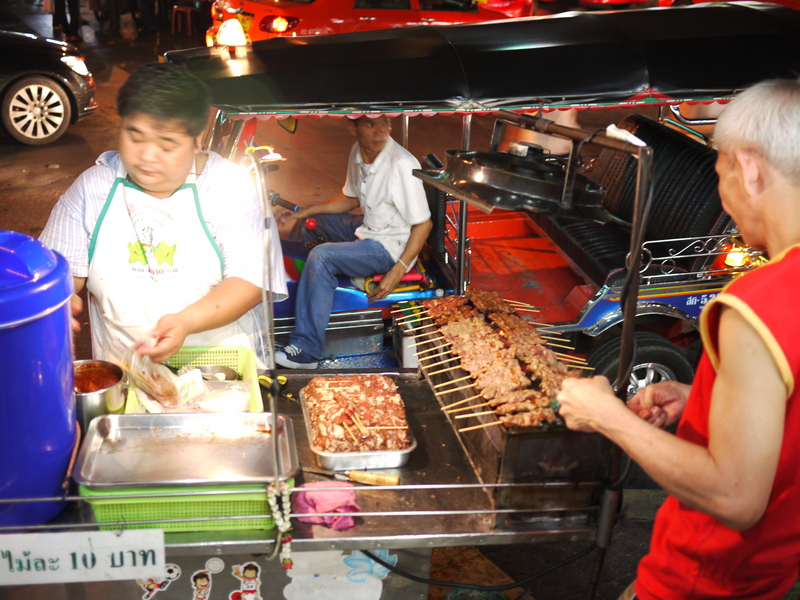 Moo-ping uncle arrives at the corner of Convent Street (Silom/ Salan Daeng) and only arrives at about 10pm everyday. Uncle will push his cart half full of hot charcoal fire (the other half full of moo-ping, obviously) to the front of the 7-11 shop. Uncle has this nonchalant mood in him and in a good way actually, he’s polite to customers (even to rude and loud ones) and attends to each patiently even though many like us, were trying to make up our minds – glutinous rice or not? 5 or 10 sticks? No rush, no grouch (or smiles), no sweat. Like doing this for a hobby (and we sometimes suspect he really does) uncle steadily goes on preparing every stick to perfection (even cutting off the burnt ends of the grilled pork!! – is that perfection or what) and serving the moo-pings to the queues of late night goers in search of street food supper, occasionally taking a break on the stairs of the 7-11 shop, talking to familiar customers. He is quite a different sight from the usual bustling hawkers in night markets. Well. thank goodness Bangkok is less than 3 hours away from Singapore. The city is a haven for a short get away. But even so, what do we do when we have such cravings and a short holiday is obviously not feasible? When that happens, thank goodness for a hubby who loves to cook. And my verdict for the @862 version (biased but for a good reason) – zzz’s recreation of moo-ping is about 70% of the moo-ping uncle’s. For 4 fat sticks of moo-ping recreated, he had used $3.50 worth of 五花肉 (fatty pork). 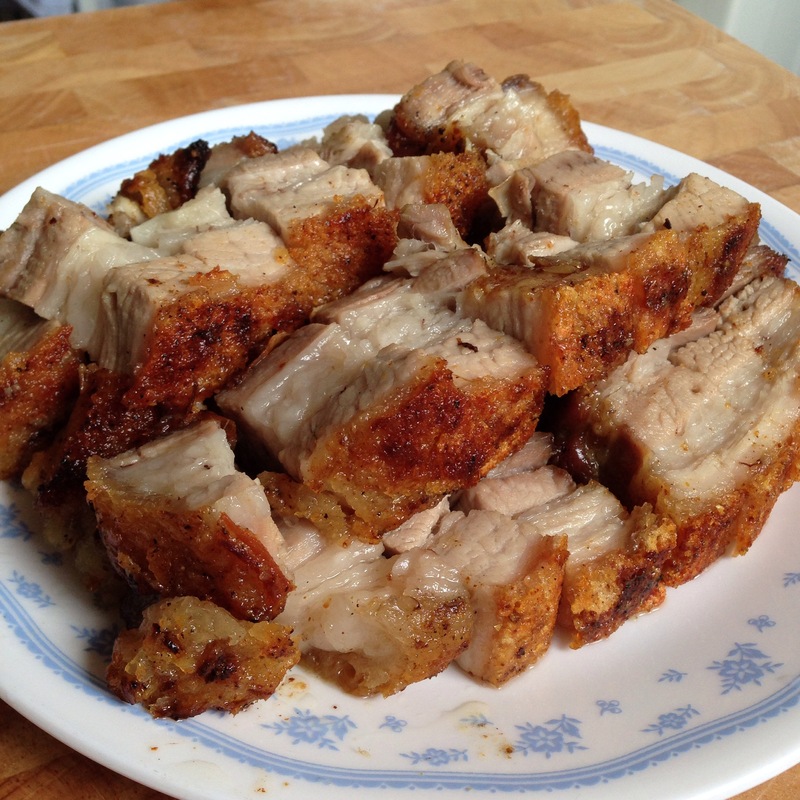 Fatty pork is necessary to keep the pork moist and tasty. He even pounded his own chilli sauce! I think the missing 30% comes from the charcoal and the slightly burnt 香气 (erm, charcoal ‘taste’ – you don’t actually eat to taste charcoal, but food cooked from charcoal fire does taste especially nicer) . And of course, the 功力 (skills) of the uncle. Ingredients for both the moo-ping and chilli sauce were abit trickier and since he really did try to recreate the taste from memory, there are no recipes that we can post here, maybe next time though. Just a note back to the original moo-ping, do buy a bottle of iced Vita black soy milk from the 7-11 behind to go with the spicy moo-pings. Guarantee to remove spiciness, very shiok! This entry was posted in Cook, Travels and tagged bangkok, moo-ping, night market eats, pork on April 14, 2011 by three3seconds.